High Dynamic Range… in case you where wondering what HDR was. The built in iPhone camera app has a option to shoot in entry level version of HDR in case you thought you had seen it before. Basically, you take a over bright and over dark image and merge them together so that the bright areas aren’t too bright and the dark areas aren’t blacked out. The effect works very well for inside of buildings and puffy clouds outside. There is a lot of other situations but those are the two types of shots you see most often by professional HDR photographers. 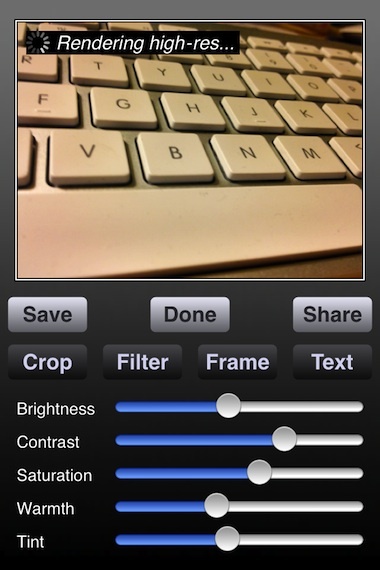 There are a lot of ‘fake’ HDR apps for the iPhone that take a single image and bring up the darker areas and add more contrast to the brighter areas. But, side-by-side, the read HDR will win for a photo that pops. ProHDR is a app that I use a lot when the need arrises. It can either take the bright/dark images on it’s own or I can manually override the shutter. The app is another universal app so it works on your iPhone and iPad2 (needs a camera of course). And, it works in landscape or portrait views. New in the update today is effect you can add within ProHDR to your HDR photos. 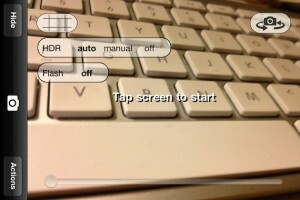 No need to snap a shot and go to anther iPhone app to add an enhancement. 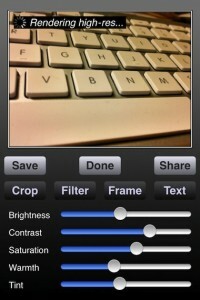 Now, you can crop, add a filter, add a frame and add text, then save to your iPhone’s photo library.